In Germany retail is posting rising sales but distribution channels are changing: How do you see the ratio between online and offline? It is true that growth is principally driven by the disproportionate rise of sales in e-Commerce. Digitalisation is a major success factor in retail – and this is also the case in physical retail. Omni-channel retail finds many applications especially in the fashion segment, for instance. Numerous companies have already well and truly left the “starting blocks” here and are fine-tuning and optimising their systems today. This is an on-going process now also evident at sales outlets. In addition to many Click&Collect zones retailers now also increasingly train their sales staff to embrace the omni-channel concept and adopt a 360° vision of shoppers and their purchasing history – not only offline but also online. To also keep pace in future every company in Germany has to participate in digitalisation. This does not mean that everyone has to operate their own web shop and online distribution. Smaller retailers benefit from cloud technology here. It allows them to capitalise on highly innovative technology without having to invest and install it themselves. 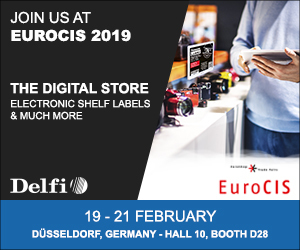 A visit to EuroCIS also helps smaller retailers searching for suitable solutions. Beyond this, Amazon is an interesting partner. With its vast market penetration and recognition levels as well as its marketplace function it provides an important distribution channel for many companies. What about payment in future? At present, there is Google Pay and Apple Pay. WeChat Pay and Alipay can only be used by Asian shoppers. But the market share of all these services is currently still very low. Though we believe we will soon see a breakthrough here. What advice would you give retailers in Germany? Try things out, be brave and keep up to date!